Road Trip – The Cotswolds part 2 plus Chelsea Flower Show – click the link to see LOTS more photos. The fabulous trip continued…. we stopped at Bourton-on-the-Water to take a quick stroll through town, then went on to Bibury. One of Bibury’s main tourist spots and overlooking a water meadow and the river is Arlington Row, a group of ancient cottages with steeply pitched roofs dating back to the 16th century. Henry Ford thought Arlington Row was an icon of England. On a trip to the Cotswolds he tried to buy the entire row of houses to ship back to Michigan so that he could include them in Greenfield Village. Rolling Hills of the countryside. Some of the hills are quite steep because of the Cotswolds escarpment, a pie shaped area of limestone from the Jurassic period tipped on its edge. Some of the hills rise 1000. Throughout the countryside are stone monuments to those who fought and died in the First and Second World Wars. And everywhere are beautiful stone fences, laid up with no mortar. The very best garden in my opinion was Highgrove, The home of Prince Charles, and unfortunately we were not allowed to take photos. After hearing a taped presentation by him about the garden and his interest in organic I changed my mind about how I perceive him. We had champagne High Tea, the gift shop was beautiful, the outdoor part was so well done I could do a dozen paintings just of it. The house was built in the 1790s and when prince Charles purchased it there was just a small kitchen garden. It is stunning and he and his gardeners have made it so it is beautiful in every season. 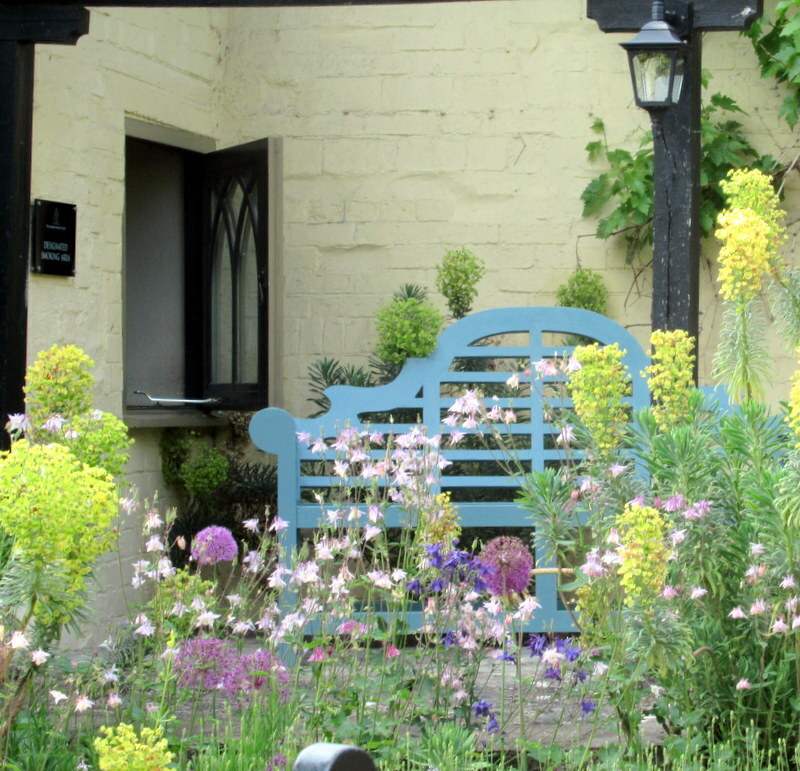 Of course I always need to post signs…..
Bourton House Gardens followed… an award-winning three acre jewel… winner of the prestigious Historic Houses Association / Christie’s “Garden of the Year” Award. The garden is surrounded by a stately 18th century manor house. Sudeley Castle… has nine individual gardens… all unique and beautiful. Elizabeth, Lady Ashcomb, is the current owner and lives on the estate. It has played a roll in the history of England for over 1000 years. Can you imagine living in a castle where a queen is buried, you have your very own ruins and a large chapel too? The castle was once home to Queen Katherine Parr, the last and surviving wife of King Henry VIII. Henry himself, Anne Boleyn, Lady Jane Grey, Queen Elizabeth I and Richard III have all played a part in Sudeley’s story. King Charles I (1600s) found refuge here during the Civil War, when his nephew Prince Rupert established headquarters at the Castle. Following its ‘slighting’ on Cromwell’s orders at the end of the Civil War, Sudeley lay neglected and derelict for nearly 200 years. King George III was amongst those sightseers who came to admire its romantic ruins. Then in 1837 Sudeley was rescued by the wealthy Worcester glove-makers, brothers John and William Dent, who began an ambitious restoration programme which was continued by their nephew, John Coucher Dent, when he inherited the castle in 1855. His wife, Emma Brocklehurst, threw herself enthusiastically into Sudeley’s restoration, at the same time forging strong links with the nearby town of Winchcombe. It is the results of Emma’s dedication that are so evident in the gardens and exhibitions at Sudeley today. If you are interested in more history. I see a painting here! And on to the next town! We spoke to the owner – he said this wisteria is at least 180 years old. Loved traveling in a small group, we went on many one track roads that most tours would never have been able to go on. While in the Cotswolds we stayed at Moreton-in-Marsh a market town granted its market charter in 1227. 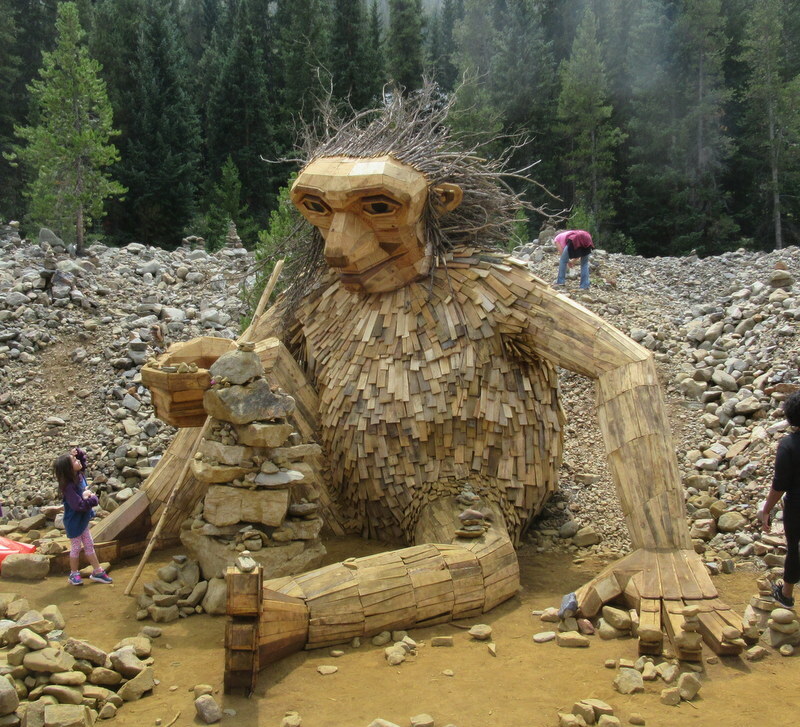 There were lots of topiary and garden decorations made from willow. I love all the plant supports made from tying twigs together. It would be fun to take a workshop on making them, if one exists in the US. They are everywhere in England. 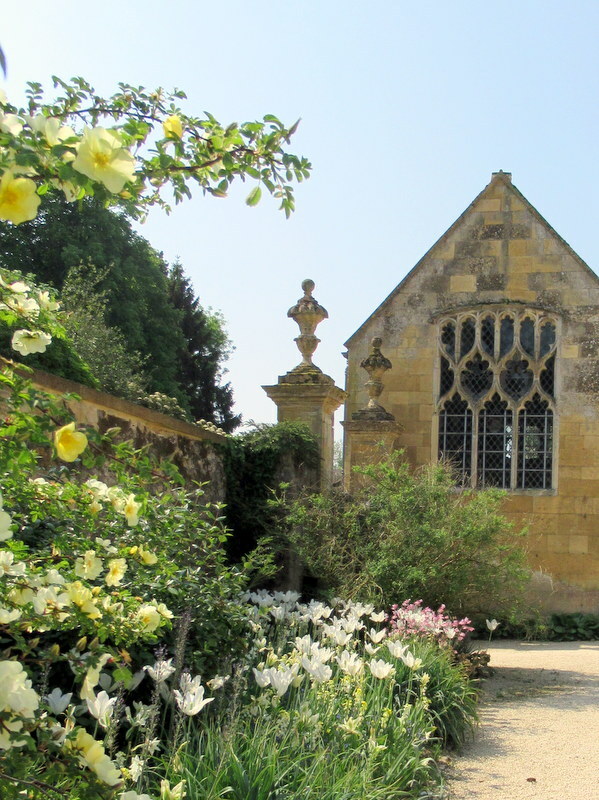 Our last garden to visit in the Cotswolds before going on to Windsor Castle was Barnsley House… built in 1697 of Cotswold stone, is a perfect example of the English country house and garden. The acclaimed garden, with remarkable beauty, was designed by Rosemary Verey, recognized as the “Grand Dame” of Cotswold garden designers. I loved the way the kitchen garden was laid out, it was as beautiful as the rest of the gardens, combining vegetables and flowers. She helped Prince Charles with some of his gardens. These snails are huge “Roman Snails”, brought by the Romans between AD 43–410 and they are protected. This one measured about 4″ long. We then visited Windsor Castle – the oldest and largest occupied castle in the world – we were scheduled to stay just across the street when that pesky wedding bumped us. People were still going nuts about the wedding which took place on Saturday and we got there on Thursday. We stood where they took their vows and right beside where the queen sat. Again no photos inside but the church is divided by a wall so most of the celebrities sat in the back on folding chairs and had to watch the wedding on a screen, so you at home had the same view as they did!! I had been in London years ago and been to all the major attractions so this time I was interested in seeing the pubs and buildings whose outside are decorated with flowers. We did have a pint here! Our last day was visiting the Chelsea Flower Show. Of the sculptures my favorites were the Alice in Wonderland and Wind in the Willows. My VERY favorite was the Red Queen. I decided to walk back to the hotel, it was a couple miles through the city, I din’t realize that the commercial district around Sloane Square was having a competition – Chelsea in Bloom – so many store fronts were decorated with flowers. I failed to mention the last two nights in London we went to two private clubs – The Oxford-Cambridge Club, and then The National Liberal Club. Both were lovely but I bet you can guess which one didn’t have as many rules and was more laid back. On the way back to our hotel I walked past Buckingham Palace. And I executed my plan perfectly, as I got to Picadilly Street, exactly as I came out off of the “Long Walk” I was at the door of The Ritz. A nice way to end an amazing trip. When I got home I took my friends advice and stayed in bed all the next day and watched “The Crown”. It was a good plan! What’s next? A couple sculpture workshops, then Michigan. Oh yes, in-between lots of artwork! I’ll post that too. Road Trip Brussels – all I can say is WOW. I didn’t know what to expect and never expected Brussels to be so beautiful with so many vibrant neighborhoods. And the most beautiful square I have ever been in. It beats Paris, Rome, Venice, London, NY, Florence – its called La Grand Place. My pictures just don’t do it justice so you can see more at this link from UNESCO – a video. It was truly breathtaking. A lot of the ornamentation is covered in gold so the whole square looks like a jewel. In a walkway just off La Grand Place is the 1902 statue of local hero Everard ‘tSerclaes. Rubbing the statute is said to bring you a year of good luck (hope it works even though this is a reproduction of the original) and a guarantee you will return to Brussels. Everard was Lord of Kruikenburg and was killed during the fifteenth century when he was defending Brussels. 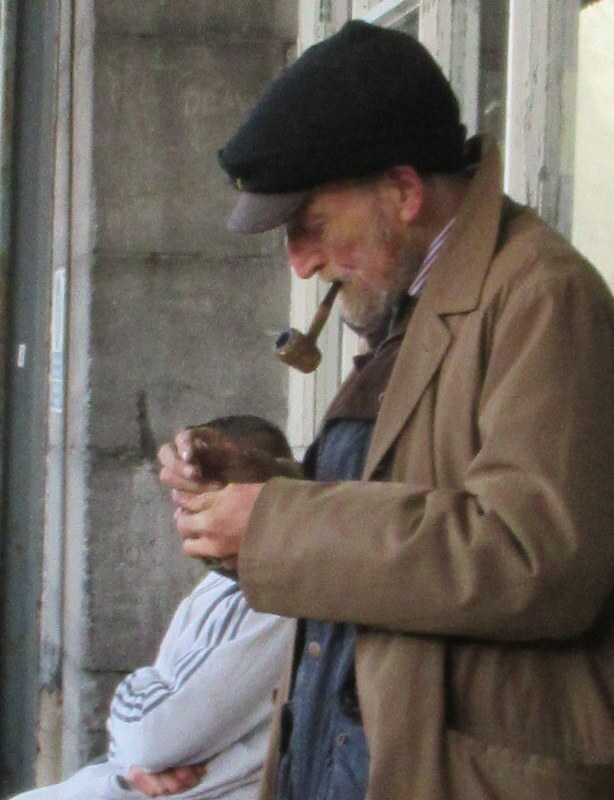 Brussels is a city of great contrasts. It is the headquarters of the European Union with a section of the city devoted to that with high rises and lots of new buildings. It makes you wonder what was taken down to build the new. The population of the city is over a million with 2 million in the metropolitan area, and there are traces of civilization that go back to the stone age, the Romans were here and the original settlement that was to become Brussels was begun around 580 AD. You see buildings that span the centuries with a building from 1600 next to one built in 2018 and any of them might have a comic strip mural painted on their side. There are many, many parks and lots of green spaces, refreshing compared to many large cities. My favorite park was The Petit Sablon Square, just a few blocks from our hotel. The park is surrounded by statues depicting medieval professions. You can’t talk about Brussels without the Manneken Pis being brought up. The statute was designed by Hiëronymus Duquesnoy the Elder and put in place around 1618. It was replaced by the current statute in 1965. They make a big deal out of him, he has hundreds of costumes (like 1000 or so!) and his clothes are changed several times a week and a ceremony is held each time – go figure. Belgium has more comic strip artists per capita than any other country. There are at least 50 murals and many statutes devoted to the art all over the city. Some of the popular strips born here are TinTin, the Smurfs, and Lucky Luke to name a few. To see more and read more about them follow this link. One of the things we saw throughout Belgium was the Espalier and Pollarded trees. I’ve talked about Espalier before but Pollarded is a new word for me. A tree that has been pollarded (pruned) means the upper branches are trimmed to control the height of the tree. Because we were there early spring the new growth had barely started. After years of being trimmed back the tree develops these “knots”. They say this way of trimming actually extends the life of the tree. If I knew it, I had forgotten it (sorry Father VanHorn), that Brussels is the world capital of Art Nouveau. There are over 300 Art Nouveau buildings there and probably hundreds if not thousands of buildings with Art Nouveau tiles on their facades. Victor Horta is the most well known, and his home is open to tour. There were two walls built around ancient Brussels, the Halle Gate is the last remnant of the second walls of Brussels. The first wall was built in the 13th century, the 2nd in the 14th century. The Aneessens Tower is a remnant of the first wall. At the cities edge is the Atomium. It has nine steel spheres that form the shape of a unit cell of an iron crystal magnified 165 billion times. It was built for Expo ’58, the 1958 World’s Fair. Five of the nine spheres, including the very top sphere are open to the public. The spheres house an exhibit of dedicated to Expo ’58, a restaurant, and a snack bar. It is GIANT!! 334 feet tall. Reminecant of Paris’s Arc de Triomphe Brussels’ Triumphal Arc was built for the 50th Anniversary of the founding of Belgium. And yes, that is a giant carton of fries on the right. Everywhere in Belgium promotes their fries, but don’t ever say French fries! There are a lot of beautiful churches and monumental buildings in the city. After Brussels we visited Ghent, or Gent, which has a beautiful medieval city center, Trier the oldest city in Germany, Bastogne to see a WWII museum and a quick fly by of Antwerp. Road trip Luxembourg Maastricht Trier – On our way to Luxembourg we stopped at the town of Maastricht. It’s the shopping mecca for miles around, designer clothes and lots of other high end shops. The one I was interested in was the bookstore. Probably the most beautiful bookstore in the world in an old cathedral. Maastricht became well-known through the Maastricht Treaty and as the birthplace of the euro. Maastricht has 1677 national heritage buildings . It was part of the Roman Empire, they don’t know when the Romans arrived but it is known they built a bridge over the river here in the 1st century AD.We went on to Luxembourg, and stayed in Luxembourg City. I was embarrassed to learn how much I did not know about the role of this city in the history of the world. There have been inhabitants here for 35,000 years, since the Stone Age! Today there are many offices of the EU here. Outside of Luxembourg is the Luxembourg American Cemetery where more than 5000 American soldiers are buried along side General George Patton. The Battle of the Bulge took place here and over 90,000 allied troops lost their lives but won the war. We then travelled to the oldest city in Germany, Trier. It was inhabited by the Celts in the 4th century BC and the Romans conquered in the 1st century BC. It is home to some major Roman ruins. The Gate The Porta Nigra, remains from the Romans as does the Basilica which was part of a large castle built by Emperor Constantine. In another part of town there are remains of the largest Roman Bath outside of Rome. The next day we started making our way toward Brussels. On the road to Bastogne we saw these markers every kilometer. Liberty Road marks the route the 3rd US Army of General Patton and the French 2nd DB (armored division) followed in 1944 during the Operation Cobra. We stopped at Bastogne and visited the Bastogne War Museum. It was an amazing and sobering experience. I’d like to know if our government officials who have never gone to war no less served in the military, have visited some of these museums to be reminded of the devastation, and yes what happens if you don’t fight when necessary. The museum was very well done and the 3 theaters were actually movie sets that you were sitting in. The Belgium countryside was beautiful and every once in a while you’d see a castle or large chateau. Gent or Ghent is another city with a beautiful medieval city center. Some people say Ghent is the place to go rather than Bruges. But I fell in love with Bruges, it seemed more intimate to me, yes there are probably more tourists there but I loved it!! These disks measured about 4 inches across and there were dozens of them in the street, don’t know why but there they were. Everywhere you turn in Belgium they are selling chocolates, beer, fries, and waffles! Odds and ends around town. Met and amazing sculptor working in bronze, Jurga. Whew! What an amazing trip. Had to end it with a nice glass of Kriek. Next Road Trip England, London and the Cotswolds to visit gardens! Of all the beautiful places we visited in the Netherlands and Belgium, Bruges was my favorite. Belgium was never on my radar but I think I will have to return. I loved the scale of Bruges and it has lots of canals and old architecture. The first fortifications were built in the 1st century BC, and the first city charter was in 1128. These photos were my first impressions of the city. Burg square is one of the earliest inhabited places of the city. Market square – since 928, is ringed with guild houses, restaurants and chocolatiers. 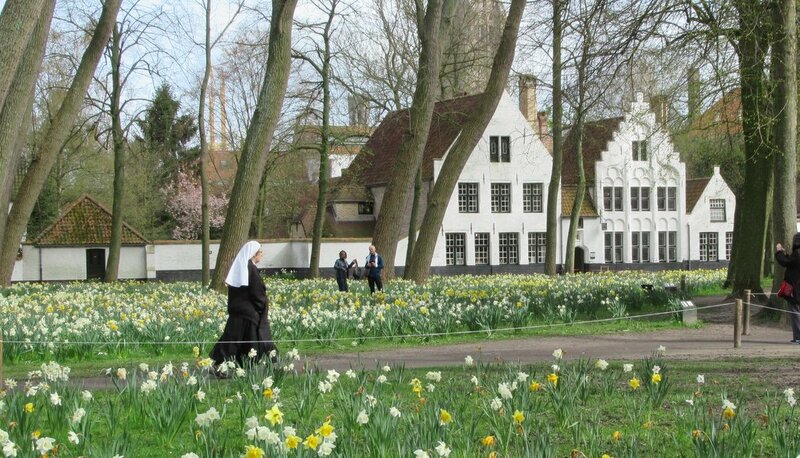 Like in Amsterdam they have a béguinage, what a peaceful place to live. And like in Amsterdam, the gates are closed at night and only those ladies that live there have a key. The city has many squares, parks, beautiful buildings, and hidden places…. …. and is well know for it chocolate, lace, and beer. Bruges has been a center for lace making for hundreds of years. The top two photos are of a large lace map of Bruges that hangs along a canal. There are often large sculptures in the windows made of chocolate, like the monkey, cartoon characters and the unicorn above. There are 3 breweries in Bruges, and I’ll have to admit I drank more beer on this trip than I have in years, my favorite was the Kriek, made with cherries and other fruits. There is art on the buildings everywhere and lots of neat wind vanes….